- How Does a Solar Cell Work? The fuel for photovoltaics, sunlight, is practically infinite, free, and easily accessible. In fact, the earth receives enough energy from the sun in one hour to fulfill the global energy demand for one year! Photovoltaic panels are extremely reliable and require low maintenance even in harsh conditions. Photovoltaic systems are very versatile as they are suitable for loads of any size; they can provide a couple of watts for small loads like lanterns or electronic gadgets, a couple of kilowatts for loads like heavy machinery and households, or a couple of megawatts for solar power stations. Photovoltaic systems are versatile also in the sense that they can be stand-alone, local grid, central grid-connected or even hybrid (in conjunction with other technologies like wind or hydro) systems. Photovoltaic systems are an ideal choice and turn out to be cheaper for remote applications away from the grid as infrastructure costs of electricity transmission can be avoided. Photovoltaic systems work best when we need energy the most, i.e. 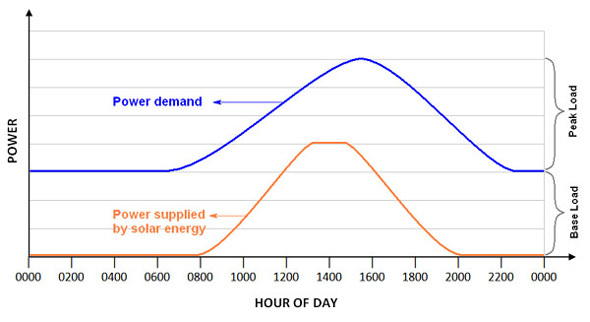 during peak energy demand period of the day. This reduces infrastructure costs for fossil-based generation plants as they have to be designed to meet peak demands, while they run to meet that demand only for a short period of time. Photovoltaic systems are modular, where additional power generating capacity can readily be added. Photovoltaic systems last at least thirty years as typically there are no moving parts involved in electricity generation; consequently, they don’t create any noise pollution. Photovoltaic conversion does not involve any polluting emissions, combustion, radioactivity, high temperature and pressure process or disposal or raw materials. Photovoltaic systems have a very short lead time for installation. Photovoltaics has a high rate of public acceptance and an excellent safety record. Photovoltaics is a green technology and has the potential to play a major role in controlling greenhouse gases and global warming. Photovoltaic industries create jobs in addition to energy, and help the economic development of societies. Thus, photovoltaics is a proven technology and a practical solution to energy crisis and security. The main disadvantage of photovoltaics is its relatively high cost compared to many other large-scale electricity generating sources. However, the cost of solar electricity has dramatically reduced over the last couple of years with advances in technology. Moreover, the cost of photovoltaics will further reduce as more and more systems will be deployed (economies of scale) and an infrastructure starts revolving around it. Even though the sunlight reaching earth carries 6,000 times greater energy than the global requirement, the power density of sunlight is relatively low. This means that photovoltaics tends to be less suited for applications that are physically small compared to the energy they require. The output of photovoltaic systems is variable depending on the availability of solar radiation. Areas with greater cloud cover and shorter days will experience lower power generations, and such systems have to be designed accordingly. Photovoltaic energy is typically stored in batteries, which increases the costs and maintenance of such systems. However, there is a tremendous thrust to improve energy storage technologies such as solar-hydrogen systems. Photovoltaic modules are typically only 13-18% efficient; this low efficiency is one of the dominant causes for the high cost. Again, this technology is aggressively pursued to further photovoltaic cell and system efficiency. In spite of the popularity of the concept of photovoltaics, there is a vast lack of knowledge, and hence, faith in this technology. Confidence in this technology will be gained with education and examples.